Are you guys loving Christmas Nails as much as I am? This Christmas season really has my creative juices flowing. I have so many more designs to show you in days to come. 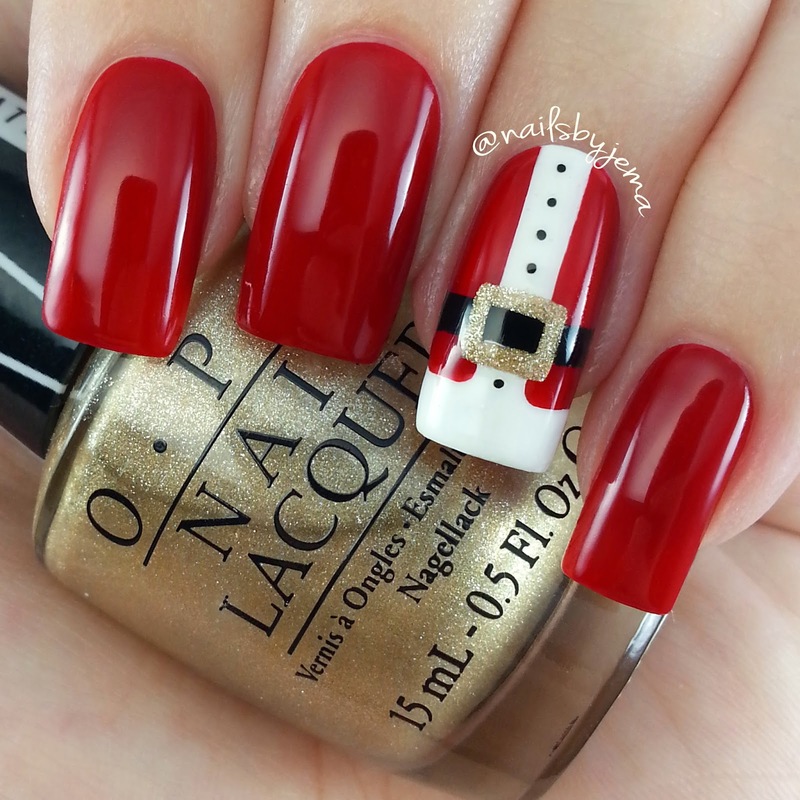 Today's mani is inspired by Santa's suit. It's so easy to paint and you don't need special tools as you can use items from around the house. For this mani I used all OPI polishes, because they're my favourite. 'Black Onyx' & 'Alpine Snow' aka my go to white and black with 'Love. Angel. Music. 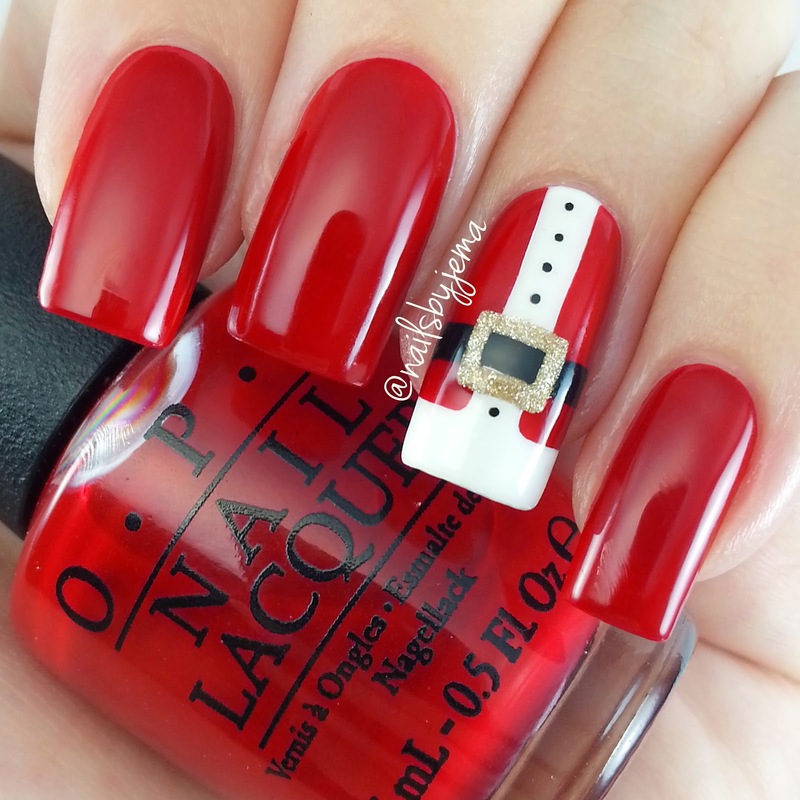 Baby' & that ah-mazing red is another OPI Gwen Stefani Holiday Collection polish. That collection has the most amazing reds ever and this one is 'What's Your Point-settia?' & it's perfectly opaque after 2 coats. Make sure you top coat any polish before adding tape, or when you remove the tape it can pull the dried polish up with it. For my photos I soaked my fingers in warm water to get them to uncurl which also removed the 'cleaned up edges polish excess' which ran onto my cuticles, making them look red. The tape is just regular painters tape cut into a thin strip and dots were done with my trusty Signo Uniball gel pen (that I am now selling. Email nailsbyjema@gmail.com for orders and inquiries). Not shown on video, the line edge clean ups. I fold my finger down into my palm to steady it when I do that and I obviously can't film it. That's why a clean lined nail keeps popping back onto screen! I just added more white polish to clean up the red line smudges with my nail art brush from eBay. If you don't have any brushes you can use a toothpick for the buckle and buttons and regular tape for the tape work. Music is one of my favourite Christmas songs: N*sync - Merry Christmas, Happy Holiday.